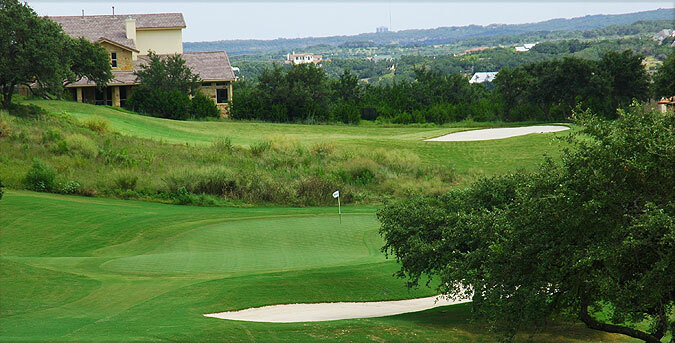 Falconhead Golf Club is a daily fee PGA Tour Signature Series course located just west of Austin, Texas. Designed to PGA standards, Falconhead provides golfers with the unmatched quality, conditioning and service that the PGA demands and its design gives it the capability of hosting championship golf tournaments. On property is a fully stocked golf shop and Talon's bar and deli. The facility can host outings for groups of up to 150 people. The practice facility at Falconhead is top notch - with a large grass range and a short game area that consists of a large putting surface, a chipping green and a practice bunker. Lesson are available for individuals and groups - with certificate PGA instructors. The immaculate greens are TiffEagle, fairways and teeboxes are Bermuda while the dense rough is a mix of Bermuda, rye and a variety of other grasses. Yardage markers can be found on the fairway and cart paths at 225, 175 and 125 yards on all par fours and fives. A stake is located on the side of the fairway at 150 yards. Six hole locations are rotated daily and the designated pin placement position is provided by the ranger prior to beginning a round. There are 27 bunkers on the course and water comes into play on only two holes. 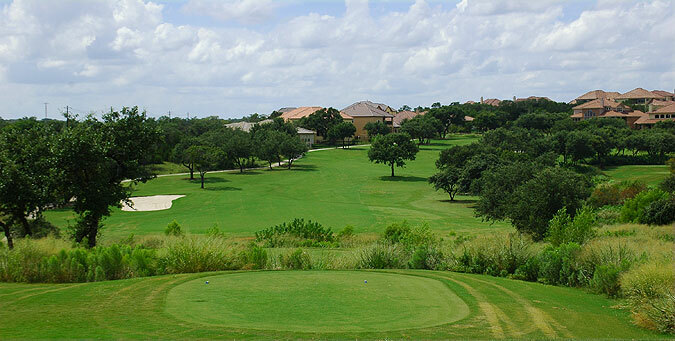 The course architect - PGA designer Chris Gray took full advantage of the Texas Hill Country topography. The dramatic elevation changes, aesthetic water features and well-heeled indigenous trees provide golfers with picturesque views of the countryside. 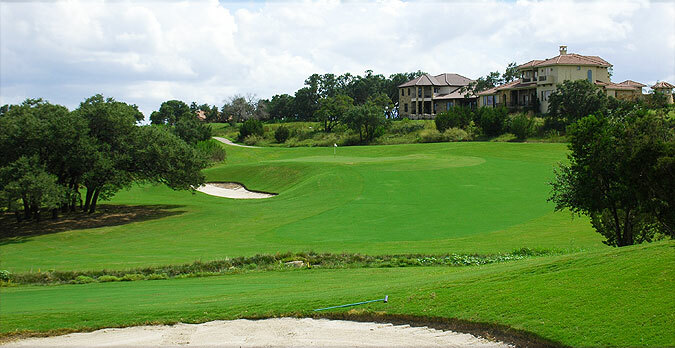 Most of the golf holes at Falconhead play from elevated tees either up or down the rolling hillsides. Ample raised greens are fast and closely manicured with slight slopes and undulations that will trick even the most seasoned golfer. Landing areas off the five sets of tees are generous - affording a fair chance at scoring well to all levels of players. The championship tees play 7,302 yards, middle tees are 6,855 yards and 6,316 yards, executive tees play 5,924 yards and forward tees are 5,202 yards. The slope of this course ranges from 129 from the championship tees to 112 from the forward tees. Because of the open fairways found throughout this course, players may tend to want to grip it and rip it. But bunkers are strategically placed on some of the holes so take care to choose the right club off the tee. There are some unusual bunker designs on the course which adds to the aesthetics while penalizing errant shots that find their way into them. and the signature hole at Falconhead Golf Club is unforgettable. It is the par 3, 17th hole that plays over water to a massive green that is partially constructed on a limestone ledge. It hangs over Friday Creek with beautiful water flora and three water falls flowing into it. Simply beautiful. Falconhead offers an incredible variety of memberships to locals and visitors and public play is welcomed. Tee times can be made up to 7 days in advance - and walking is allowed at restricted times. If you're in the Austin area, be sure to play a round here. Falconhead won't dissapoint!